Here’s a round up of what’s been happening on Jobs recently. Remote jobs are some of the most sought after jobs but there are nuances to remote work that weren’t entirely transparent to you. Some companies offer remote positions but require employees to be in a certain timezone while others might require you to be in-office once a week or a few times a year. Gervasio added the ability for employers to include specific details about remote work so that you can make informed decisions when you consider an opportunity. If employers offer remote work, they must choose between “On-site and limited remote” or “Remote.” If the job is limited remote, then they must add a location and have the option to include additional notes. If they job is fully remote, they have the option to include timezone preferences as well as the option to work in office. Remote details such as time zones requirements or employer notes are displayed on the job listing. Aurélien added the ability to exclude specific companies and industries in job preferences. Your job preferences help us send you better job recommendations. 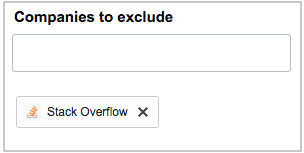 When you fill out your preferences, we treat them as hard filters when sending you job recommendations. So if you never want to see a job from Nope Inc. in your inbox, just exclude Nope Inc. in your preferences. When it comes to job search, your job preferences act as weights when jobs are sorted by ‘matches’ rather than hard filters. Excluding a company or industry in your preferences will push these jobs to the bottom of your search list but won’t hide them altogether. Disliked tags operate in the same way. One more thing to note — job ads run on a different system and don’t take job preferences into consideration, yet. However, dismissed jobs are synced across the job ads system and job recommendations so if you dismiss a job anywhere on site, you shouldn’t see that job pop up again as an ad or recommendation in your inbox. Most of you are already familiar with the various job and company search filters available but a common piece of feedback we received through our monthly visitor survey was that it’d be great if you could filter by things like technologies, developer roles, or salary. This was a clear signal that although these filters are available, users had a hard time finding them. Ian and Piper worked on exposing job and company filters, which were previously hidden behind a filter pane. You may have experienced a time when you submitted an application, only to realize you attached the wrong resume or forgot to include a cover letter. Oops! Gervasio added the ability to undo an application, immediately after it was submitted. When you submit an application, you’ll see an ‘undo’ link displayed in the success message. It only appears for a minute but it should help you out for those accidental moments. In tandem with Q&A, Jobs is now responsive. This effort is ongoing and we still have some areas to make responsive, like Developer Story, but most Jobs features can be carried out on smaller screen sizes. Company pages got a new look and feel. Kirti and Courtny reformatted the layout and styling to support new features down the line. They are now responsive and the underlying code was cleaned up significantly to help make it easier to add new features going forward. Company pages serve two users. 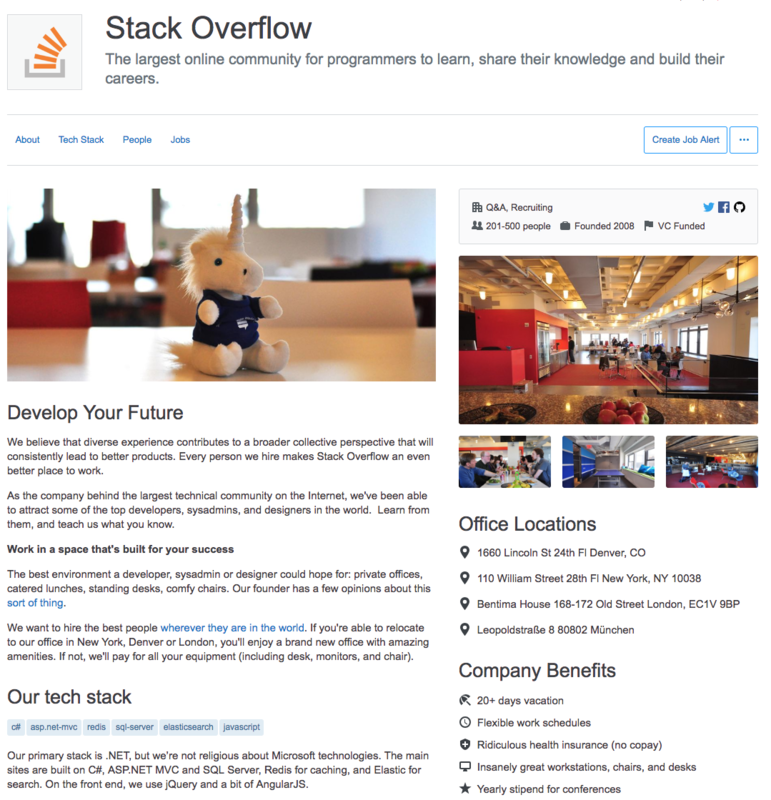 Companies, who want to have a presence on Stack Overflow to reach the wider developer audience and developers, who are searching for additional information about a company. We’d like to improve company pages to offer more useful information. This part of the product is being refined to improve a developer’s ability to communicate with & about companies – learning not only about job opportunities but the products they build and developer cultures embedded within. We are currently exploring ideas to better serve the developer community and are very interested in hearing from you what you’d find valuable or useful to see. Our eyes and ears are open, and we’d love to hear from you. If you have thoughts, please post it as an answer below. One thing which I really dislike about Jobs (not just on SO, but in general) is that companies put "Junior, Mid-level, Senior" for almost all their postings. I opened the Jobs page and saw this at the start. 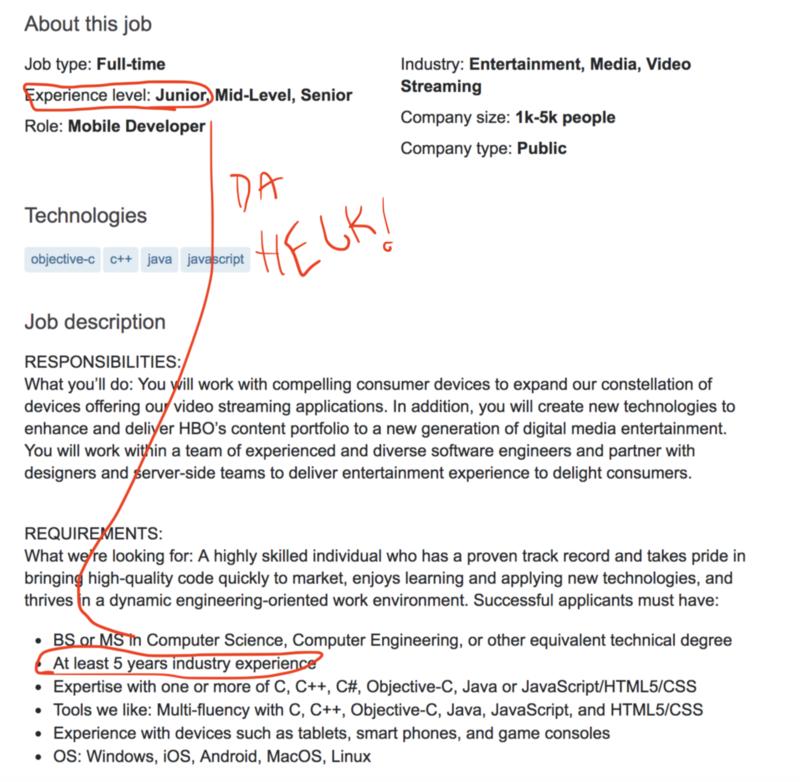 The job posting is for "Senior Staff Engineer at HBO" and the experience level marked is Junior. They need people who are at least 5 years experienced. I've been searching for Jobs and sorting for "Junior" has always been polluted by jobs which need 3+ years of experience after grad (considering 3 years as the Junior limit). Can we have an explicit "Experience (years)" field alongside the "Experience level" field? x company pages remote which allow remote - say that again?